Jonathan Jones, owner of Southwest Diner, holds up a sign during a rally supporting St. Louis' higher minimum wage. Activists are seeking to put a statewide minimum wage hike on next year's ballot. A campaign committee angling to put a minimum wage increase on next year’s Missouri ballot has received more than $500,000 from several nonprofit groups. These contributions come amid a fierce debate over politically active nonprofits’ influence on elections. Such groups are not required to reveal their contributors or how they spend their money. Raise Up Missouri was formed earlier this year to get a ballot initiative before voters raising Missouri’s minimum wage to $12 an hour by 2023. It’s a reaction of sorts to a new state law invalidating local minimum wage increases in both St. Louis and Kansas City, which piqued the attention of labor unions and activist groups from around the country. Since late September, nonprofits known as 501(c)(4)s, The Fairness Project and the Sixteen Thirty Fund, and a 501(c)(3), the National Employment Law Center, have donated a combined $537,500 to Raise Up Missouri. A recently enacted constitutional amendment setting up contributions limits and other restrictions does not affect ballot initiatives. These nonprofits’ money could be critical to getting the minimum wage measure on the ballot, since it often costs hundreds of thousands of dollars to gather the necessary signatures. Spokespeople for the National Employment Law Center and the Fairness Project did not return messages from St. Louis Public Radio. But the executive director of the Fairness Project, which was formed to pass minimum wage boosts across the country, told Oregon Public Radio last year that his group received initial funding from the labor union United Healthcare Workers in California. “If we spend our lives vetting organizations wanting to help us, we wouldn’t have time to do what we need to do — which is get over 100,000 signatures on petitions to get this thing on the ballot,” Prince said. Raise Up Missouri has also received thousands of dollars from labor unions, including $25,000 from the St. Louis-based chapter of Laborers International Union of North America. It’s also taken in dozens of small donations from individuals. The nonprofits’ donations come amid increased scrutiny of how such groups get involved in Missouri politics. Since Gov. Eric Greitens came into office earlier this year, both Republicans and Democrats have been critical of how his former staffers started a 501(c)(4) called A New Missouri to promote the GOP chief executive’s agenda. Like the groups that gave to Raise Up Missouri, A New Missouri doesn’t have to reveal its donors. That’s led some legislators to call for new laws requiring disclosure if these types of groups get involved in Missouri campaigns. But those types of efforts have run into opposition, especially from conservatives who contend that disclosure requirements are an affront to free speech. And barring legislative action, it’s likely that nonprofits will be able to donate to political action committees and ballot initiatives without revealing their donors. A constitutional amendment known as Clean Missouri would require a "federal political action committee" to disclose contributors if it donates to a candidate, but not if those groups give to a PAC or a ballot initiative. Prince said there’s a difference between nonprofits that support candidates and those that support ballot initiatives. Raise Up Missouri has until next May to turn in signatures to get on the 2018 ballot. 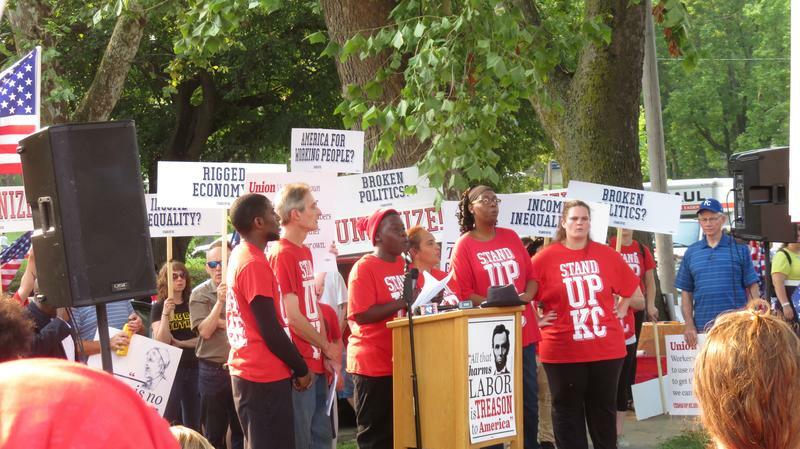 Several hundred Kansas City-area fast-food workers, along with members of labor unions, clergy and their supporters, started Labor Day with an early morning rally on the grassy lawn at 33rd and Southwest Trafficway, stressing their demand for $15 an hour and union rights. By a margin of fewer than 900 votes, residents of Kansas City, Missouri, on Tuesday acted to prohibit city officials from moving forward with any streetcar extension without first gaining citywide voter approval.